except figs. 12 and 13, which have their own scale bar. Fig. 1, 2, 6, 7, 11. Spongurus minor, some with ovoid and some with more spherical shells. A double spiral is visible in figs. 1 and 2. BSS 21B(F) EF C27, BSS 15B(F) EF 20 and 3 x BSS 28B(II). Fig. 3-5, 8, 14, 15. Larcospira haliomma. Note pylome at right in fig. 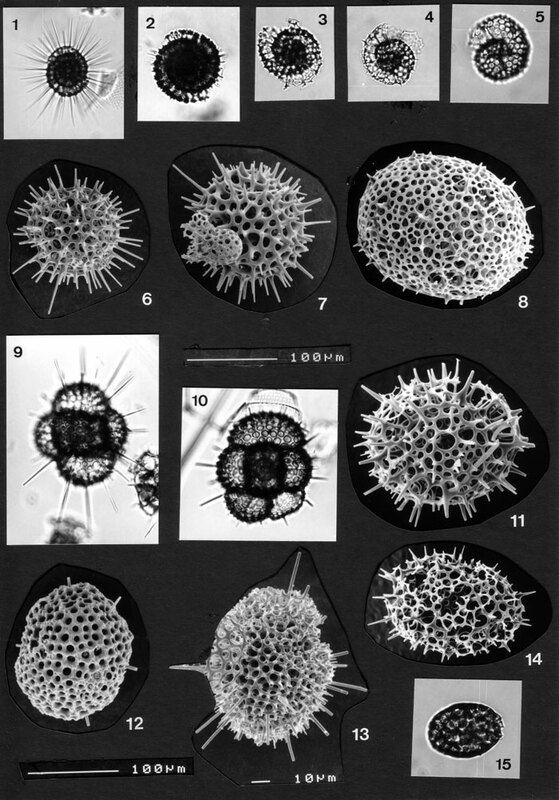 8, and differences in pore-plate development of the specimens in figs. 8 and 14 and those of pl. 54, figs. 8 and 11. BSS 26B(F) EF X48, 15B(F) EF D40, 32B(F) EF R44. BSS 28BUD (2x) and BSS 36B(F) EF P21. Figs. 9, 10, 12. Amphitholus metallasson. Fig.10: abnormal specimen with five outermost chambers, one of which is poorly developed (lower right chamber, with thinner shell and irregular outline). Fig. 12 could not be identified with certainty because the internal structure is not visible. BSS 5OB(F) EF L39, BSS 27B(F) EF Q23 and BSS 28B(II). Fig. 13. Spongurus ellipticus. 28B(VIII/981).